HOWABN1: Hi-Gain Outdoor Multifunction Access Point Support WDS Mesh Network Solutions plus the 14dBi HAO14SDP Outdoor antenna will go extra distance for you. Dual-Function: Multiple Solutions in One Weather Proof Outdoor Unit. Satisfy all of your outdoor wireless needs with the Hawking Hi-Gain Outdoor Wireless-300N Multifunction Access Point. This versatile device combines an access point, an Ethernet bridge, and a Wi-Fi repeater into a single convenient device. And thanks to its completely weatherproof design, it can be installed in any outdoor environment. The HOWABN1 increases the wireless coverage of your wireless network up to 2X larger. It reduces your wireless deadspots, provides extended coverage for outlying devices. In addition, it stabilizes your wireless connection with high performance broadcasting technology. For the previously out of reach devices, you'll see an improvement in the data transfer speed and a reduction in lag while streaming or downloading multimedia content video, music, etc. With the addition of the HOWABN1. The HOWABN1 is a 2.4GHz wireless 802.11b/g/n compatible solution that allows you to repeat signal from any wireless access point or wireless router. This product is designed with multiple operating modes: Range Extender (Repeater), Access Point, Bridge, Point-to-Point, Point-to-Multiple Point, and WDS Bridge. The Multifunction Access Point provides optimal connectivity, regardless of what mode you're using. It features two high-gain antennas which allows the device to function over large ranges. So whether you're using it as an access point or as a repeater, the Multifunction Access Point will give you a robust signal with the extra high power HAO14SDP 14dBi Antenna. Use the HOWABN1 to connect to your boat. Use the HOWABN1 to create an outdoor hotspot. Use the HOWABN1 to extend coverage from one building to another. Use the HOWABN1 to bring your wireless network outdoors. The Multifunction Access Point has a durable design that can withstand the elements. Its outdoor enclosure is sturdy and watertight, and all of its components are waterproof. A waterproof gasket kit is included for coating the RJ-45 Ethernet jack, so you won't have to worry about water damage to the repeater. The HOWABN1 also comes with a Power-over-Ethernet injector. This convenient accessory eliminates the need for a separate power cord; instead, power is transmitted to the repeater through your Ethernet cable. This helps reduce cable clutter and saves you the trouble of running a power cord outdoors. For added convenience, the cable can connect up to 300 feet and is extendable using an Ethernet switch. High Speed 300 Mbps Wireless-N networking. Converts wired networks into wireless-N networks. Complies with 2.4GHz Wireless 802.11b/g/n network standards. Features multiple operating modes and Power-over-Ethernet option. Use the chart below to see which Hawking Technologies Wireless Access Point / Bridge is right for you. The HOWABN1 Hi-Gain Outdoor Multifunction Access Point is a great wireless solution for consumers looking to take their network outside. Extend the Distance of your Wireless Devices or Bridge a Connection from Point-to-Point! The HAO14SDP Hi-Gain 14 dBi Outdoor Directional Antenna Kit is a heavy duty, weather proof, high powered antenna for extending the range of your existing wireless 802.11 b/g/n WiFi devices. Whether your application requires extending a wireless signal from one building to another or simply from one end of the house to the other end, the Hi-Gain 14 dBi is the perfect solution. The power rating of WiFi antennas is measured in terms of decibels (dBi) with most standard antennas measuring just over 5 dBi, the HAO14SDP boosts power to a staggering 14dBi. The Hi-Gain Directional technology concentrates your wireless signal directly towards the wireless source from your network. This results in a significant increase in wireless distance. When paired with another Hi-Gain 14dBi antenna, the outdoor directional antenna can be used to create a point-to-point solution that can extend farther than normal coverage. Installation of the HAO14SDP is simple. It is compatible with most wireless devices on the market with removable antennas. The Hawking antenna comes equipped with N-Type, RP-SMA connector to support a wide range of wireless devicse. Hookup this antenna to the Outdoor HOWABN1 will go extra distance for you to cover up to 30 acres. One HOWABN1 Wifi 802.11N AP/Bridge/Repeater. One POE Power Adapter 100V to 240V input. One Set up Wizard CD-ROM. 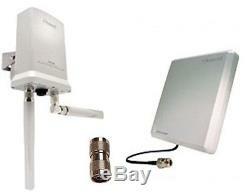 The item "High Power WiFi Access Point and Hi-Gain 14dBi Antenna(HOWABN1+HAO14SDP+HONRA)" is in sale since Wednesday, September 25, 2013. This item is in the category "Computers/Tablets & Networking\Home Networking & Connectivity\Wireless Access Points".